Workplaces should be more centre stage in the work to improve work environments. That is the recommendation from an expert committee appointed by the Danish government, tasked with turning around negative workplace developments. The quality of Danish work environments is deteriorating despite the fact that most workplaces do more than ever to create a better work environment. In only four years there has been a 17% increase in the number of workers who say they experience psychological strains and symptoms of stress or depression. At the same time 15% more workers say they are exposed to physical strain and experience pain and fatigue after work. The work environment has seen a marked negative development, which can be costly both for those who are directly hit and for the social economy. Denmark is moving further and further away from the agreed political aim for how the work environment should develop towards 2020. This was the conclusion the government made in 2017, before appointing an expert committee tasked with identifying how the work environment could be brought back on an even keel without increasing the costs of work environment measures. That task has now been solved. 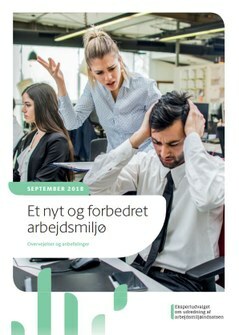 After one year’s work and thorough analysis of work environment measures both in Denmark and in other countries, the committee has presented 18 recommendations which all point to the fact that work environment measures to an even greater degree should take into account the actual conditions in the workplaces. One of the recommendations from the committee is that the national inspection authority, the Danish Working Environment Authority, improve their targeting of businesses and trades that are known to have work environment issues. Higher fines should be given in cases of severe breaches of the work environment act. The work environment authority should also play a greater role in advising businesses. One survey carried out on behalf of the expert committee showed there is a willingness to turn the development around in many workplaces. The survey shows leaders and workers already prioritise work environment measures, and that nearly half have increased their focus on work environments in recent years. Yet this reprioritisation has so far not managed to turn the negative development around. The committee also believes there is a need for clearer rules on psychological work environments, and proposes to make it easier to train leaders in how to prevent psychological strain. Minister for Employment Troels Lund Poulsen (V), who appointed the committee, now wants to present its recommendations to the Danish parliament’s employment committee, before opening up political negotiations about them. “The Danish people’s work environments are at stake here, so it has been necessary to make sure no stone has been left unturned in the work to figure out how to improve the measures,” said the government minister as the recommendations were presented. The expert committee comprised four skilled experts and four representatives from the social partners, including Bente Sorgenfrey, President of the Confederation of Professionals in Denmark FTF, which represents 450,000 public and private employees. The FTF President is happy the committee has recommended to strengthen the measures for a good physiological work environment. Bente Sorgenfrey encourages the government and mayors who agree about the need to sharpen the measures needed to improve the work environments to roll up their sleeves. They must act quickly to develop clear rules for how workplaces should prevent and handle challenges created by big workloads and time pressure, unclear demands, high emotional demands and work-related violence – all issues leading to stress and absence. The central organisations in the labour market, DA and LO, have both signed up to cooperate closely to realise the proposals that can be agreed on, and have promised not to bring in new proposals during the upcoming political process of executing the expert committee’s recommendations. It is still not clear whether more resources will be allocated to put the recommendation into action. Several political parties and trade unions have expressed serious doubts about whether the recommendations can be realised if the labour inspection authority is not allocated more resources – after several years of cuts. FTF does not believe the recommendations will make much of a difference if more money is not allocated to the improvement of work environments, according to Ulla Sørensen from the United Federation of Danish Workers 3F. She has also said that 3F will support more targeted measures from the labour inspection authority with more obligations and sanctions, while 3F is not at all happy about the expert committee’s proposal of giving the labour inspection authority an advisory role through a daily dialogue with businesses. 3F fears this would take time, which would be taken from the time the authority spends controlling the businesses. The expert committee on measures for the work environment published the report “A new and improved work environment. Considerations and recommendations” in September 2018. A common goal:The government and the social partners will identify common goals for good work environments, taking into account the current problems in workplaces, so that employers, leaders, employees and others pull in the same direction. Focusing on inspections and more guidance:The labour inspection authority will focus on workplaces with the highest risk of working environment problems, and act to solve those problems. The inspection authority will also provide more guidance. Clarity surrounding rules and bigger fines: Rules should be accessible and understandable, and there should be greater economic incentives to prevent work environment problems. Strategy for research:A new strategy for work environment research and knowledge should be developed. The committee has sought inspiration from other countries, including Sweden and Norway. Ca 17% more workers report that they suffer from psychological strains, e.g. emotional demands, time pressure, bullying or violence. They also experience symptoms like stress or depression. Ca 15% more workers report that they have been subject to physical stress at work, and that they have experience pain and tiredness after work. Nearly half of recognised occupational illnesses recorded in the period were related to skin, cancer and lung disease, which often occur as a result of exposure to chemicals. The number of serious workplace accidents have fallen by 18%, but it is still higher than in a country like Sweden. Since 2011 it has been a political priority to reduce the number of people experiencing psychological and physical stress. Source: “A new and improved work environment. Considerations and recommendations”.